18+ First Deposit Only. Min. deposit: £10, Maximum amount of free spins is 100. Game: Wild Wild West The Great Train Heist, Spin Value: £0.20. WR of 30x Deposit + Bonus amount and 60x Free Spin winnings amount (only Slots count) within 30 days. Max bet is 10% (min £0.10) of the free spin winnings and bonus amount or £5 (lowest amount applies). Free Spins must be used before deposited funds. Bonus Policy applies. BeGambleAware. 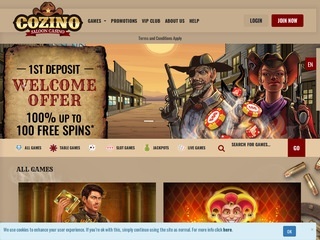 Cozino Casino will then reward you with a bonus (Welcome Bonus is for new players only). 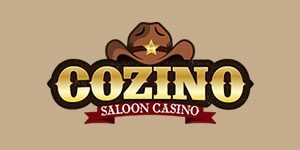 The terms and conditions of the bonuses vary between different casinos and might also change over time and between different countries, so it is important to compare the different offers and read the T&C for Cozino Casino before signing up. You are only allowed to participate if you are at least eighteen (18) years old or of legal age as determined by the laws of the country where You live (whichever is higher); in this respect, the company wishes to draw your attention to the fact that underage gambling is an offence.